Dad learned how to make traditional German recipes which were passed down through his family. Many of these were made annually when we butchered a pig. My favorite was a liverwurst recipe which Dad called pig pudding. It is also referred to as piggy pudding or meat pudding. This recipe utilized some of the parts which many would discard, like the head. After thoroughly cleaning the head, remove any hairs and eyes. Soak it in clean water for several hours to remove any blood; you can cut the head in half to make easier handling. Rinse and place the head in a very large kettle. I add to the head all the liver, heart, about 4 pounds of fresh pork roast, any other scraps, skins and about a pound of jowl bacon with rind. Cover with fresh water and I cook this for several hours until the meat falls from the bones. Remove the meat from the broth and cool enough to handle. 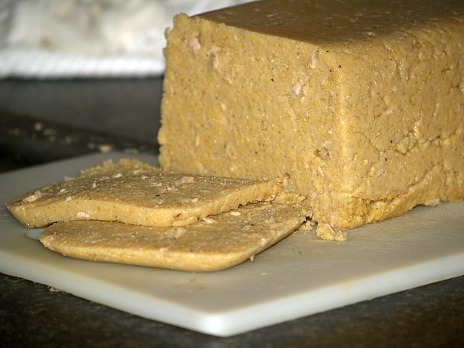 Cool the broth and skim fat off the top; this is good to make what we call scrapple or mush. 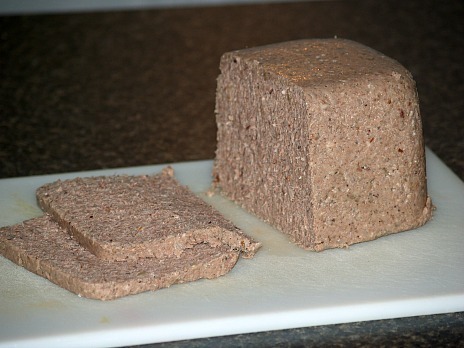 (IF DESIRED RESERVE A LITTLE MEAT TO CHOP FOR THE SCRAPPLE). When cooled, pick all the meat from the bones and grind fine in a food grinder. Grind 5 to 6 large onions into the mixture (or however many you like). Put mixture back in a pot over medium high heat continually stirring. If mixture appears to be dry, add some of the broth; not much only enough to make like a thick batter. Season with salt and pepper. If you like add some sage or red pepper. Bring mixture to a boil and pour into a deep loaf pan or several small loaf pans. Refrigerate overnight before slicing. This makes great cold sandwiches with a slice of fresh onion and spicy mustard. Dad learned how to make this traditional German recipe paan haas. It is like mush; after it gets cold and firms up, it is sliced and fried. It was so delicious for breakfast with Mom’s tomato preserves or molasses. We usually had a serving of sausage or bacon with it. As Dad learned how to make this traditional German recipe, it could vary each time he would make it. It all depends on how much meat he cooked for the piggy pudding and how much broth he would have left after covering the meat and cooking it. Nothing was ever wasted, not even the broth. If he had lots of broth, he simply added more cornmeal which made lots of paan haas. Here is what I used; sometimes I will use nutmeg and other times I will use sage. Add seasonings AND CORNMEAL to the broth when it is cool. NOTE: If you add cornmeal to hot broth the cornmeal will be lumpy. Cook over medium heat until hot and thickened. Spoon into loaf pans; cool and then refrigerate overnight. If he prepared them ahead of time, he would cook until tender. He then removed all the large bones and placed the pig’s feet in large mouth Mason Jars. He added salt, pepper, a bay leaf and some red pepper to each of the jars. Then he poured apple cider vinegar into the jars over the meat. Store these jars in the refrigerator. They can be processed in a pressure canner for long term storage. Souse meat is another traditional German recipe and is also made with pig’s feet and other meats. The meat is totally stripped from the bones. The gelatin coming from boiling the bones of the feet and hocks is what makes souse meat set up. In a pot add enough water just to cover meat; add salt and cook until meat falls from the bones. Remove the meat from the bones and chop coarsely. Strain the stock and return the stock to the pot; add onions, pepper and allspice. Let it come to good rolling boil. Turn off the heat, add the vinegar; set aside for pouring over the loaf later. Place the chopped meats in loaf pans and pour vinegar mixture over the meat. Let set to cool; refrigerate until cold and congealed. Cabbage and potatoes are to ingredients that are in many traditional German recipes. Wash cabbage and cut into quarters and then slice very thinly; cook for 10 minutes in salt water and drain. Slice peeled potatoes and slice; cook slices in salt water about 10 minutes and drain. In skillet fry bacon until crisp and drain off fat. In saucepan melt 5 tablespoons butter; add flour and milk stirring constantly until thickened. Season mixture with salt, pepper and nutmeg; set aside. Butter casserole dish; layer half of cabbage, half of potatoes and half of bacon. Pour half of sauce over layers; layer remaining ingredients and dot with remaining 2 tablespoons butter. Sweets are like this black and white cookie are popular in traditional German recipes. Combine flour, baking powder and 2/3 cup sugar in a bowl; make a well in center. Add to the well the egg, vanilla and almond; add walnuts and butter and knead until smooth. Divide dough in half; to 1 half mix in cocoa and 2 tablespoons sugar. Wrap separately and refrigerate both halves for 30 minutes. Roll out BOTH halves into rectangles 11X13 inches; place dark half on top of light one. Starting at the 13 inch side, carefully roll up tightly (Like jelly roll). Refrigerate roll for 30 minutes; PREHEAT OVEN TO 400F degrees. Slice roll in ¼ inch thickness; place on greased cookie sheets. Bake about 10 to 12 minutes until edges are golden.